This project was created on 08/21/2018 and last updated a month ago. This project is a digital, polyphonic, modular synthesizer. Like a standard modular synth, my design consists of a number of removable modules, which are responsible for different elements of the sound (oscillator, filter, amplifier, etc), and which can be patched together to create unique sounds. 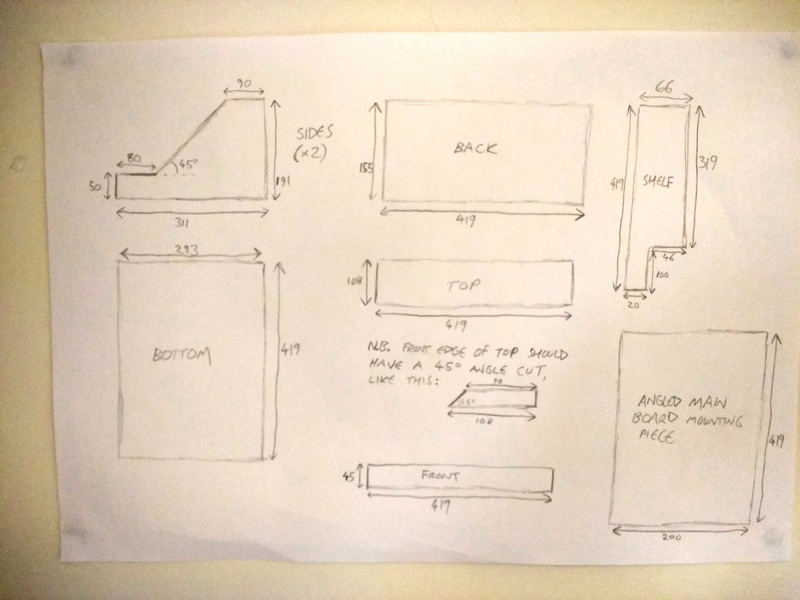 However, while a standard modular synth is analogue throughout, my design is entirely digital. Instead of each module containing the analogue circuitry to generate or process an audio signal, the modules in my synth simply detect connections between each other and pass this data back to a Teensy 3.6 which is running a dynamically generated software synth. Besides being a relatively inexpensive route into modular synthesis, this alternative design approach also allows users to easily create polyphonic patches (harmonies/chords), something that is difficult to do in an analogue modular system. This was a fun and worthwhile diversion, partly because I wanted to provide an easier way to get started building a PolyMod-style synth, but also because taking the PolyMod concept back to basics was a useful intellectual exercise, forcing me to concentrate more on my code. I started by building an unwieldy three-breadboard design, before refining it down to two breadboards. This design included 16 patch sockets (oscillators, filter, LFO, amplifier, envelope, etc), an octave&apos;s worth of tactile buttons, two potentiometers, and a MIDI input. I was really pleased with how much I&apos;d been able to squeeze in, but since the tutorial was in two parts, I also needed an even simpler (but still functional) design that builders could end up with at the end of part one. I wasn&apos;t sure whether it was possible, but with some cosy chip placement, I was able to get a design working on a single breadboard with 8 patch sockets (oscillators, LFO, filter, amplifier) and two potentiometers. The synth wasn&apos;t able to do much other than make annoying siren noises or filter sweeps, but it was technically a semi-modular synth on a single breadboard, which was cool. While the concept of the breadboard synth was based on the PolyMod, there were a few differences. Firstly, I didn&apos;t want to get into connecting and disconnecting virtual connections in the code, because it&apos;s a relatively undocumented feature and not hugely easy to explain. Instead, I did something a bit controversial and connected every single output to every single input simultaneously, via mixers, and just turned the mixer channels on and off to match the physical connections (see tutorial for more details). Connecting everything to everything else in this way doesn&apos;t scale very nicely, and therefore isn&apos;t really practical for the main PolyMod project, but it does have an advantage: since all the connections are going through mixers, it&apos;s possible to connect multiple outputs to a single input. Inspired by this, I&apos;m going to try and write a more advanced virtual connection class for PolyMod 2, which will allow automatic mixing of input sources - this will have interesting uses for CV inputs, and obvious benefits for audio inputs. Keep an eye out for the next issue of Hackspace, which will hopefully feature part two of this tutorial, and let me know if you get stuck building the synth. Okay, that&apos;s enough typing. I suspect this new iteration will be different enough that I should make a new Hackaday project for it, so stay tuned! I&apos;ve got a bunch of other commitments but I&apos;m aiming to get a PCB version of my synth working by the end of the year. This project is confusing to explain to people. Even quite technical people. Even quite technical musical people. It has layers of potential misunderstanding, like an onion which turns out to have a potato in the middle. Modular synthesizers have experienced a renaissance in the past few years, as people are attracted to the amount of control and invention available when compared to a regular synthesizer. The other main selling point is the analogue nature of the sound - there is a feeling that using analogue oscillators, filters, and other components gives an inherent warmth to the audio. However, it is wryly acknowledged among modular synth users that it is a very expensive way to make sounds, particularly when compared to software synthesizers. A full modular system with a keyboard is likely to cost £2000+, while extra modules can cost anything from £50 to £500+ each. These prices put modular synthesizers out of range of younger and poorer musicians, which is a shame. There are software equivalents, such as the excellent open source project VCV Rack, but they lack the tactile interactivity of a physical synth. The PolyMod consists of a Teensy 3.6 (basically a tiny computer) and a series of modules. Each module in the PolyMod is simply a collection of sockets and potentiometers, with no audio circuitry whatsoever. When the synth is turned on, the computer scans each module to see what type it is (oscillator, filter, amplifier, etc). If the computer detects an oscillator module, for instance, it creates a virtual oscillator module in a software synthesizer. The computer then continually listens for connections between the modules&apos; sockets. If a patch cable is connected between the oscillator&apos;s square wave output and the synth&apos;s master stage, for instance, the software synth will also create this connection, and a square wave will be heard. If the user removes the patch cable, the software synth will delete the connection and the sound will cease. Performing the synthesis in this way means that I was able to build a working modular synthesizer (including eight modules) for about £150. What&apos;s even more exciting is that the modules themselves only require about £4 of components each. In a way, this is comparing apples with oranges. The appeal for a lot of serious modular synth users is, after all, the pure analogue sound, whereas the PolyMod produces all its audio digitally. However, I think the audio quality is certainly good enough to be of interest to people who couldn&apos;t afford an analogue modular setup. What&apos;s more, there is one rather exciting feature that the PolyMod has, which can&apos;t be replicated on an analogue modular synth... polyphony! Well, rather excitingly, I was one of the winners of the musical instrument category! This means I&apos;m now doing a last-minute scramble to make sure my project is fully documented ready for the finals deadline. Accordingly, here are lots of photos of my synthesizer, inside and out. There are two sockets on the back: a standard 1/4" audio output jack, and a USB power input, which can also be used to upload new code to the Teensy. This is what the synth looks like it with no modules in it. Note the metal threaded inserts at the top and bottom, which allow the modules to be securely screwed in place, and the slotted wooden section just below the white circuit board, which helps to align the modules. Here is a close-up of the 12-pin module headers. This circuit board is mounted on nylon standoffs. Here is a typical module (this one is a filter) with three knobs and six sockets. Viewed from another angle, you can see how the second row of sockets is mounted using nylon standoffs. I took a photo of two modules side by side to demonstrate that there is almost no difference in circuitry between different modules. The only thing that really changes is the layout of the knobs and sockets. Back inside the synth now, this photo shows the back of the master module, which has a monophonic/polyphonic toggle switch, a volume control and a couple of LEDs. The unusual L-shaped board was a compromise to allow the Teensy to sit below the master module - I will change this in the future. And here&apos;s a photo of the main circuit board, which is basically just a Teensy (with an audio board) and four 4051 multiplexer/demultiplexer ICs. The overwhelming number of wires (which mainly communicate with the modules) is a weakness of the design. I hope to solve this in my next prototype, which is very likely to use a proper PCB rather than stripboard! Finally, here&apos;s a look at how the keyboard mechanism works. Again, it&apos;s a bunch of multiplexer chips (I promise I do sometimes use other chips, this project just happened to need loads of the same one!). There is a tactile button under each key, and the keys themselves were borrowed from an old toy keyboard and secured with machine screws. I&apos;m really happy with how this whole project turned out. I wasn&apos;t sure whether the Teensy would be powerful enough for polyphonic synthesis of this complexity, but it worked brilliantly. I also worried that latency would be an issue, but I&apos;ve managed to iron out any problems and latency is currently imperceptible. I have a few ideas for future improvements, such as adding a save feature for patches, and adding onboard audio recording, but mainly I just want to keep designing and adding modules and experimenting with the synth to see what kind of sounds I can get out of it! It&apos;s Saturday, 9 AM, two days until the deadline. Oxford is grey and murky. I&apos;m psyching myself up for the final push, watching the Battlebots final while I wait for the clock to tick round to a reasonable hour to use power tools on a weekend. The modules are now supported by an angled shelf, and (once I have built front panels for them) will be held in place by thumb screws, screwed into threaded inserts both above and below. The keyboard is now also in place. There was no real need for a keyboard for this project, and most people would have simply added a MIDI input instead, but I wanted a standalone instrument that I could play with minimal setup, so I looked for ways to include a keyboard. I settled on repurposing the plastic keys from a cheap toy keyboard, positioning each key over a tactile button and routing the 32 keys through four multiplexers to reduce the number of Teensy pins required. I could have gone further and reduced the keys to just one pin, but I was doing okay for pin availability and was also worried about latency, so settled for four. I&apos;ve also added USB and audio jacks on the back of the synth. Top tip: whenever possible, avoid square holes. Maybe there&apos;s a good way to cut square holes in a way that isn&apos;t messy and/or slow, but I certainly haven&apos;t found it yet. N.B. The instructions listed here should be sufficient for you to recreate my prototype synth. However, there are likely to be features that you feel are unnecessary or that you would like to implement differently, so I would recommend only using these instructions as a guide for you to create a synth that is suited to your own needs. Don&apos;t be afraid to diverge from my design decisions! Position the components and wires according to the illustration below. Solder the components then cut the tracks. Make sure to use headers rather than soldering the Teensy directly to the stripboard, and don&apos;t add the Teensy just yet. You&apos;ll need to refer to a diagram of the 4051 chip to see which channel is on which pin. Once you&apos;ve wired up channel 6, wire up the other sockets in the same way (i.e. the wires from socket 5 go to channel 5 of the various 4051 chips). Here&apos;s a photo of how the module sockets are supposed to look, in case that helps! Solder stackable (extra long) headers to the Teensy, such that it is has male pins protruding below and female headers on top. Solder male headers to the Teensy audio board, such that its pins protrude below, and push the audio board&apos;s pins into the Teensy&apos;s female headers, making sure the pin numbers are aligned. Test the Teensy before connecting it to the main circuit board by uploading some test sketches from the Arduino IDE. Try "Basics/Blink" to test the Teensy itself and "Audio/Synthesis/PlaySynthMusic" to test the audio board (music should play through the headphone socket). Next, carefully push the Teensy into the appropriate female headers on the main circuit board and check it still works. If it cuts out or you can&apos;t upload sketches any more, disconnect the cable and check your soldering. I&apos;m going to have a go at building the Hackspace version of the PolyMod synth. Although I&apos;m an experienced musician and electronics enthusiast, I&apos;ve only recently started learning Arduino programming and have had no experience with the Teensy. So this will be my first big project and hopefully you or the other contributors can give me some advice If I get stuck. If I get the breadboard version up and running, I would like to make a more robust permanent working synth and I was thinking about using banana plugs and sockets for the Patch Matrix which leads me to question 1 : Is it ok to patch two, three or more CV signals into the same input or will that cause conflict? eg patching envelope CV, Key CV and LFO into the SAW OSC input. Question 2: Can this synth be integrated into other CV/Gate synth modules? I have followed this project for a while, and I absolutely love it. It looks great, sounds great, and piques my love for synths. I play around with my Midibox every now and then but your project just sounds so... awesome! The idea of making a digital synth which connects like an analogue one is incredible. I want to play with it! That sounds amazing! I seriously need to sit down and build a synth, even if it&apos;s just a kit based on someone else&apos;s design (like yours). It&apos;s so satisfying after all that soldering to hear sounds coming out of your creation! Amazing work !!! I&apos;ve worked on something similar last summer but with switched jack sockets and sending messages to pure data for live patching of modules. Your solution is way clever !!! That sounds like a really cool alternative, did it work well? Would be interested to see the results! Really really really great job! Wonderful documentation too! I Like a lot your plan for the 2.0 version too. Hi there, I&apos;m not very familiar with Arduino (even if I developped a lot i the past... but in assembler) and looking at your code on github, in the .ino file, the ENVELOPE_MODULE is written twice (line 118), it must be the CRUSHER_MODULE I think. Congrats, your code is pleasantly readable and well structured. 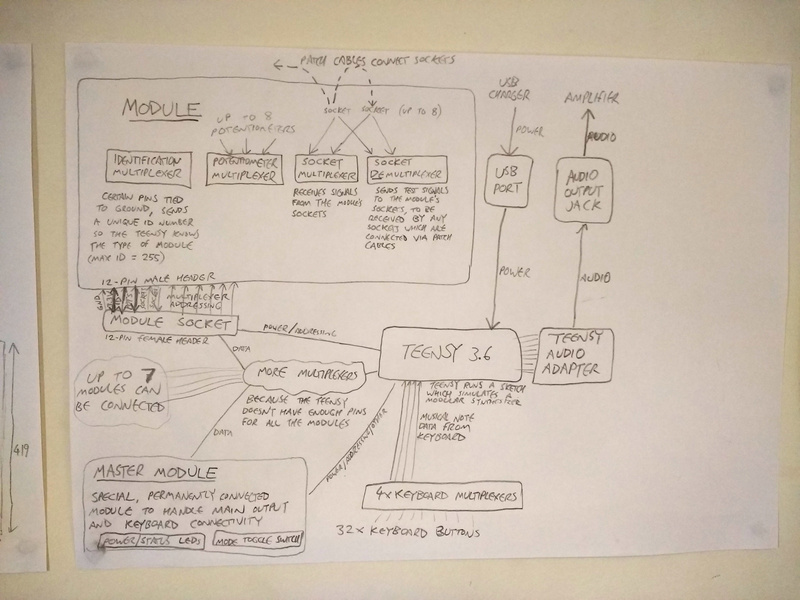 I like the idea of creating virtual analog modules in a digital environment. I&apos;m gonna make something very similar but with a matrix, as on the EMS AKS. Hi, thanks for the nice comment :) Yes, that line does look a bit odd, but I can explain. That whole block of code (from line 108 to 119) is actually currently unused (note the if(false) statement). It was a section of code which allowed me to simulate modules in software before I had actually built them, and the two envelope modules were because I wanted to use one as an amplitude envelope and the other as a filter envelope. Hope that makes sense! This is a really inspiring project. I have been tinkering with the Teensy Audio Library for about a year with a view to building a synth. Recently I have been juggling with the apparently conflicting requirements of creating a presentable and usable instrument that isn&apos;t just a breadboad rats nest while allowing for future expansion and experimentation. I think you have solved my problem. Good luck with the competition! Thanks Roger! Really happy my project helped you :) Would love to see what you make. I have got the extra hardware I need on order and am hoping to make a start over the Christmas break if everything turns up in time. 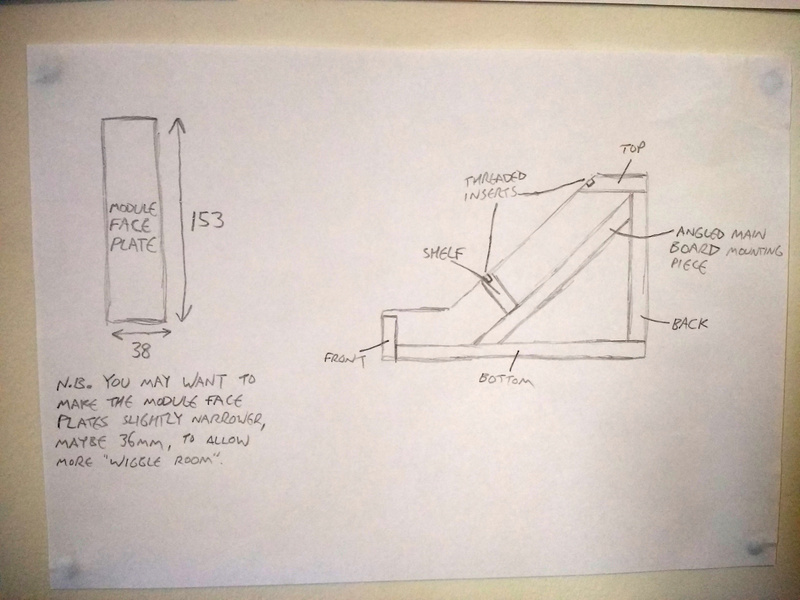 I am a metalworker rather than a woodworker, so mine will be built in aluminium. Wood...right up my ally. Nice job! You are about to report the project "PolyMod: modular digital synthesizer", please tell us the reason.